In the early 20th century, series put out by publishers were smart marketing tools that not only sold more books, but were instrumental in shaping public imagination and literary taste by providing accessible (‘cheap’) books destined for the home library. For example, the Everyman’s Library is such a series, one reprinting classic literary works, which I remember seeing on my grandparents’ bookshelves. Publishers’ series capitalised on new technology that made printing cheaper and accommodated colour illustrations and photographs in the text. Plus, effort was put into appealing designs of the covers and dust jackets. These attractive books were (and still are) desirable collectables. 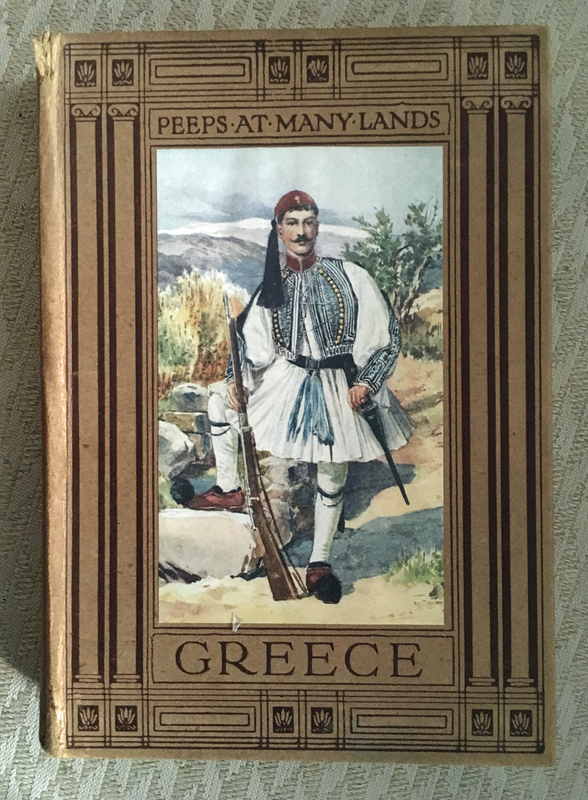 In my search for old travel books on Greece, I stumbled on one of these series when I picked up a copy of Peeps at Many Lands: Greece by Edith A. Browne, originally published by A. & C. Black publishers in 1909, but my copy (sans dust jacket) was a reprint, dated 1913. Adam & Charles Black, publishers of Encyclopedia Britannica, produced a number of series in the early 20th century, including those aimed at children in their various Peeps series: Peeps at Industries, … Great Cities, … History, … Nature, … Great Railways, … Great Men, etc. The most popular in the series, however, was Peeps at Many Lands which included both modern countries as well as ancient civilisations. I could find only a little about the author Edith A. Browne. Her dates were 1874–1963 which came from a library catalogue. Significantly, however, she was one of the early female members of the Royal Geographical Society, elected on 14 April 1913 (as reported in the Geographical Journal for May of that same year). She was also responsible for a number of books in A. & C. Black’s list. The titles Tea (1912), Cocoa (1920), Sugar (1911) and Rubber (1912), Vegetable Oils (1924) were written by Browne in the Peeps at Industries series. She also authored (in A. & C. Black’s Great Buildings and How to Enjoy Them series) Gothic Architecture (1906), Norman Architecture (1907), Early Christian and Byzantine Architecture (1912), Romanesque Architecture (1910), and Greek Architecture (1909). In the Peeps at Many Lands series, she authored Panama (1913), Spain (1916), South America (1915) and not least, Greece (1909). Lastly, she co-authored The World’s Best Recipes (1935) with Jesse Williams and Black’s Domestic Dictionary (1920) – the latter a reference book on domestic advice – with Myriam Rothschild. According to the title page in Black’s Domestic Dictionary, she was listed as a lecturer at the Imperial Institute from 1916-8. The Institute, later in the 1950s became the Commonwealth Institute, was a cultural and educational institution that had originally been set up to encourage trade and links within the Empire. She was also listed as a lecturer in Harrod’s Stores (1917-8) and a demonstrator of food preservation methods. It seemed she was someone who dabbled in many subjects. Another travel author, Monica Krippner, whom I blogged about before (Beyond Athens) also wrote for a similar series – Invites travel guides for the publisher Hutchinson in the 1950s. Both series were formulaic (i.e. each book in the series contained similar categories of information), but, unlike Krippner, Browne’s Peeps at Many Lands are not specifically travel guides. The Peeps books were geared for school children who wished to know more about the culture of a particular country. So, much of Browne’s narrative in Greece is peppered with numerous tales of quaint folk, their customs and occupations. These are told through the guise of her and her companion’s personal adventures in the countryside and towns, interspersed with a few observations on antiquities. Of course, she was also restricted to the geographically smaller pre-WWI Greece, unlike Krippner’s post-WWII Greece. Epirus, Macedonia, Thrace, a number of the Aegean islands and Crete were not part of the nation in Browne’s time, as she clearly states and shows on a map in the first chapter, ‘Greece: an Enchanted Land’. In six pages, Edith Browne encapsulates the history of Greece, wrapping it in ancient legends familiar to British school children, but she ends with a brief encounter with a Greek native on the Acropolis (again, similar to Monica Krippner’s encounter with a local on the Acropolis in her introduction). The Greek is shown to be hospitable and generous despite Browne initially mistaking him for a beggar. He tells her he loves the English as his grandfather was an English philhellene who fought in the Greek War of Independence, thus bringing history up to the relatively recent past and the origin of the modern nation state. There follows a chapter on the physical description – the striking mountains, the enchanting blue sky, the ever present sea. Further is a discourse on ‘The Modern Greek’ stating the dubious claim to their link to the ancient Hellenes followed by a long discussion of their variety of costumes, including the Albanian foustanella that had become a national uniform, shown on the front cover of the book. 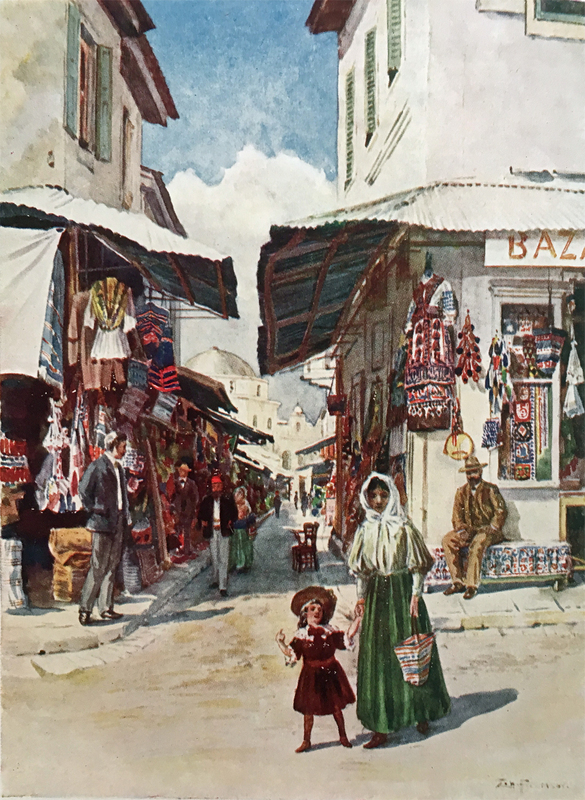 ‘Manners and Customs’ in two chapters are next, stressing the hospitable nature of the Greeks, their curiosity, the offers of food and drink – generosity balanced by Browne’s description of sharp haggling and trading with merchants and businessmen. The egalitarian nature of the country is shown in their attitude towards education, which she says is ‘so well cared for … that the poorest boys can become doctors’. Clacking komboloi beads, kafeneion etiquette, thick Greek coffee, syrupy mastica liqueur, turpentine-like retsina, smelly goat’s milk, lack of good water, a preponderance of beans and coarse brown bread, salt cod, soup with egg and lemon, the popular pilafi of rice and scraps of meat, outdoor taverna seating in all weathers and French style restaurants for wealthier patrons feature in her descriptions of food and customs. Finally, in chapters six through eight, we get to the description of Athens and the city’s duality – part ancient, part modern. The ancient monuments of the Acropolis and the brilliance of ancient builders feature quite heavily in these chapters – perhaps extracts from her book on Greek Architecture, published in the same year. Only at the end of chapter eight is there a description of the modern bazaar which caters to tourists as well as locals. 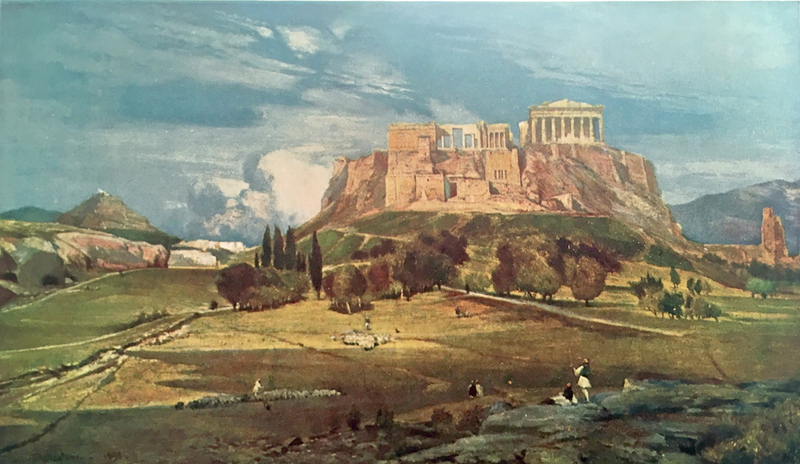 From the images that accompany this chapter, it is clear that the Acropolis is romanticised with the pastoral scene below and the lack of buildings of the modern city. The ‘bazaar’ at Monasteraki, on the other hand, looks pretty much the same as it does today, except for today’s modern clothing. Ancient and modern themes are repeated in the chapters dealing with Delphi. During a long and steep evening walk from Itea to Delphi, Browne tells scary stories of brigands as they pass through the dark olive groves (much like the childhood tradition of telling horror stories at night), of their relief upon reaching a café at the half-way point where they feasted on grapes, and of their final arrival at the village of Delphi in the dark. Unlike Athens, personal stories feature more heavily than the description of the antiquities. The ancient site of Delphi is described as simply as ‘a hill crown, jewelled with old stones knit together into majestic buildings’. Browne wraps up with what appears to be ‘leftover’ topics of wayside scenes, festivals and native industries. Bootblacks, itinerant greengrocers, nut vendors, street food in the form of grilled corn, water sellers feature in the towns (much like they do today). In the country and at the seaside, common features are women spinning and weaving, crops being harvested, boats setting sail for fishing. Carnival descriptions and Easter celebrations take pride of place in the chapter on festivals – including the famed dance at Megara on the Tuesday after Easter and the elaborate training the girls undergo in school to be able to participate in this important dance. 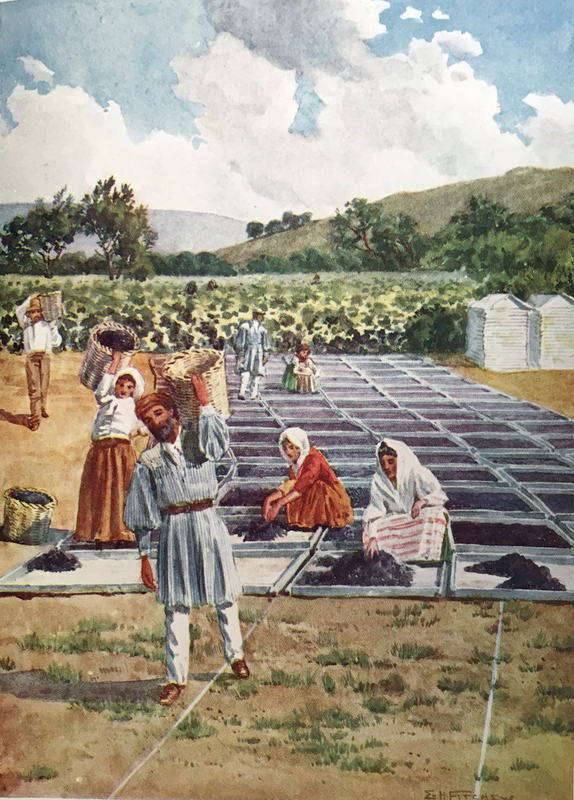 Currant production takes up three chapters, an industry that obviously caught Browne’s attention. Greece was the major source of currants used in British baked goods at the time, and therefore something familiar to her reading audience. Browne indicates that her information comes from a book she was shown on the subject kept by an English family of currant merchants from Patras. 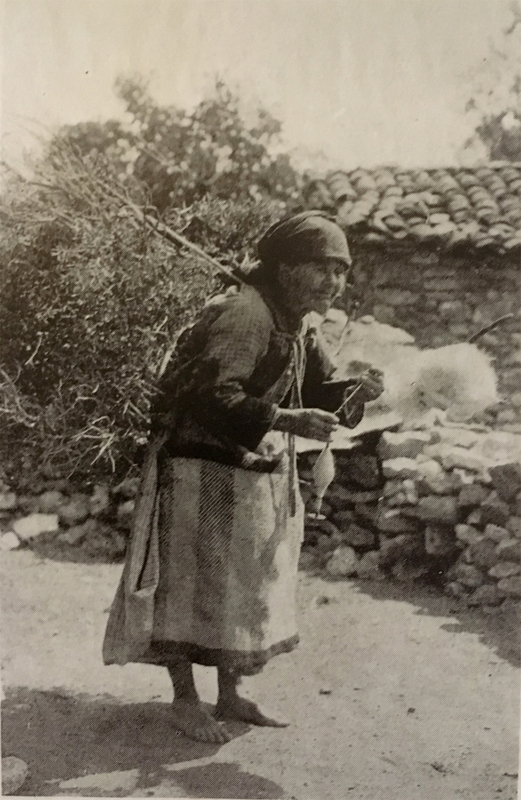 She describes the extent of the currant vineyards throughout the Peloponnese and on some of the Ionian islands, the growing cycle and harvest, the sun drying (see image below), the transport, the markets, the sorting, the warehouses in the port cities of Corinth, Vostitza (modern Aigio), and Patras, the packaging, the shipment of crops from these ports to areas around the world. The concluding chapter of the book are her observations of travelling in Greece. Here she discusses the excellence of the railway and steamer infrastructure for travel, but also states that riding or walking is required to reach more isolated spots. Browne and her companion chose, as she says, to travel the ‘native way’ – third class travel for the most part – which she asserts brought her in more touch with the locals. Although after one horrendous experience in the bowels of a steamer, she fled for the more civilised parts of the ship equipped with the luxury of padded seats. The watercolour reproductions in the book that liven the text as we have seen above were designed to appeal to children. They were not first hand observations, but I noticed that they were compositions drawn from commercial images, most likely commissioned by the publisher. 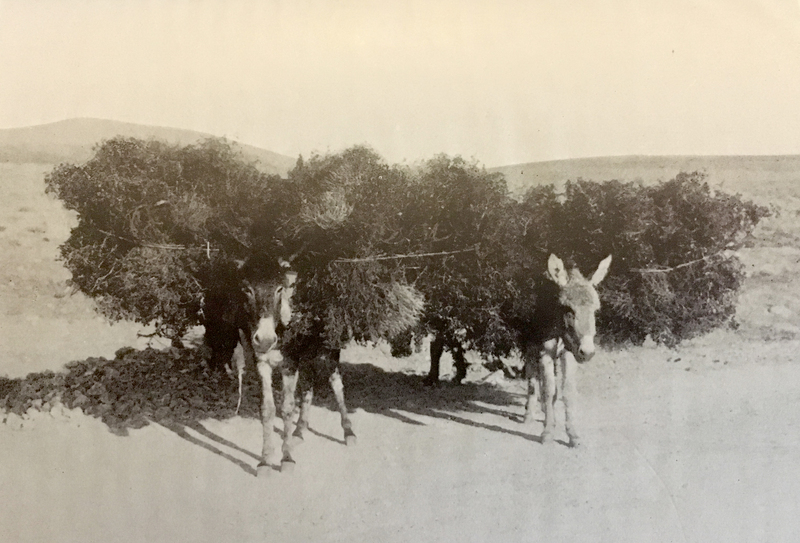 By chance, two of the images (from the ‘Wayside Scenes’ chapter) resonate with two photographs reproduced in Ellen Bosanquet’s book Days In Attica where the source is listed. 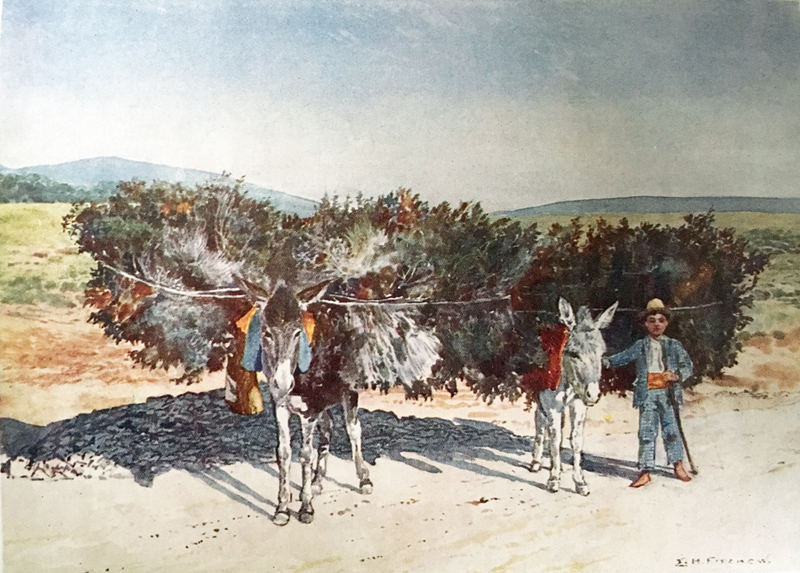 You can notice how close the watercolour of the donkeys carrying brushwood is to the photograph – with the addition of colour and the boy moved to the front for human interest and scale. Loads of Fuel, Days in Attica, photograph from W.A. Mansell & Co.
Below, the image of weavers is a composite of several commercial images, one of which is the old lady from Eleusis who multitasks: carrying a load of brushwood while industriously spinning – something Browne describes, but I suspect it was not a first hand observation, but came from this photograph. This woman shows up on the left of the watercolour. The weavers and the man behind come from other commercial images which I recall having seen before. 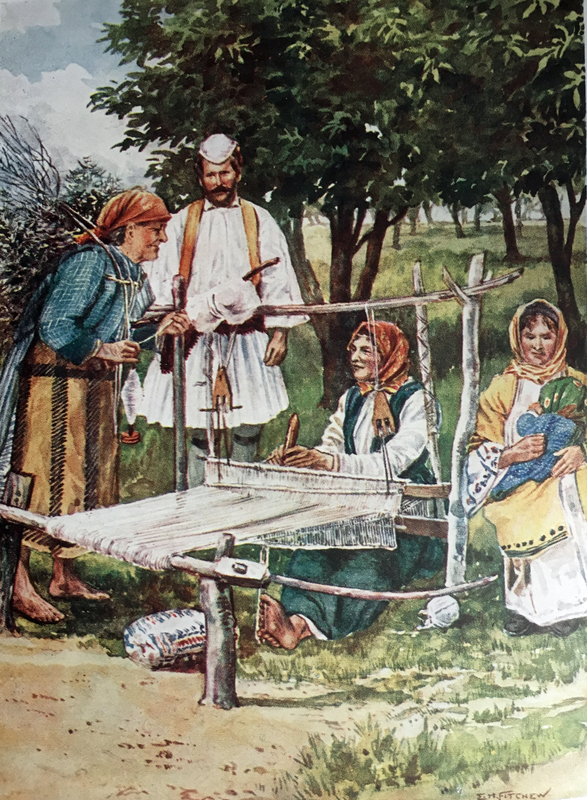 Left: Peasants Weaving, Peeps in Many Lands: Greece, illustrated by E.H. Fitchew. Right: Woman of Eleusis, Days in Attica, photograph from W.A. Mansell & Co.
Peeps at Many Lands: Greece reads a bit like an Encyclopedia Britannica entry for ‘Greece, Modern Country of’. It ticks all the relevant categories: history, physical description, customs and festivals, major industries, capital city, etc. Except, it has a more engaging and personal narrative, sometimes reading like a ‘jolly’ adventure story, weaving the bits together from personal observation and secondary sources like the commercial images. And, although antiquities feature in some parts of the book, the real gems are Browne’s descriptions of the people and how they lived their lives. I was particularly struck by the description of currant production. It could almost have been expanded for one of the Peeps at Industries series. It was a throughly enjoyable read. It is perhaps the child in me, but I found your essay on the Peeps series such fun. Peeps at Many Lands, sound to be intriguing and your description of the “Greece” issue was wonderful. I don’t remember having such books growing up in the US, but I do remember an inexpensive kids encyclopedia that was sold grocery stores that was written in much the same manner. Now, I’m off to AbeBooks to see if I can find the series. Thanks so much for a great post. We didn’t actually own any of these books, but they’re certainly part of my childhood. An interesting piece of social history and period reportage. Fascinating stuff. The Peeps books are new to me, but then I grew up in the US where we had similar book series. I find looking at old travel books very interesting – definitely pieces of social history. Ditto with historical cookbooks! Great research here. I loved seeing the black and white photo altered with hand colouring and the addition of the boy. The illustrations brought back memories of similar childhood books on other lands. It is always interesting to note the language used by British travellers to foreign lands, though there aren’t too many clues here on that topic- other than ‘native’ for travelling third class, and the romaticisation of some photos, perhaps becasue the book was more factual and encyclopedic in style as you have noted. Thanks Francesca. I do like finding these little books. The illustrations nagged at me. Since I’ve been working on an old photographic collection which includes numerous commercial images, I knew I had seen some of them before. Language people use to describe “others” is very interesting, particularly in historical accounts. “Peasant”, in addition to “native” are often how locals are described. Plus, there is generally a barrier put up between “us” and “them”, which is why Edith Browne’s comment that she generally travelled 3rd class surprised me a little. I suspect she did this as a way to economise and to gather local colour for the book.